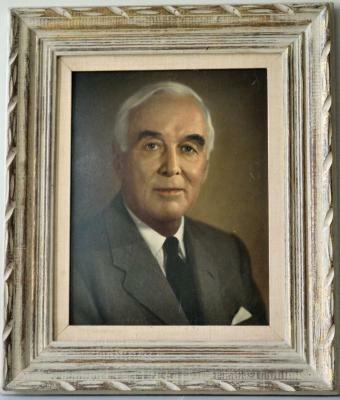 Framed photograph of J. Allen Boone. White hair, he wears a grey suit with a black tie. 8 architctural drawings of the Durst Residence located at 10 Liberty Street. 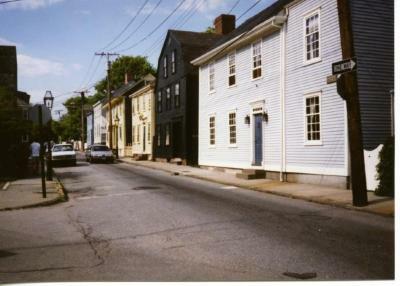 Panoramic photo of the construction of a slave prison set for the movie Amistad at Queen Anne Square. 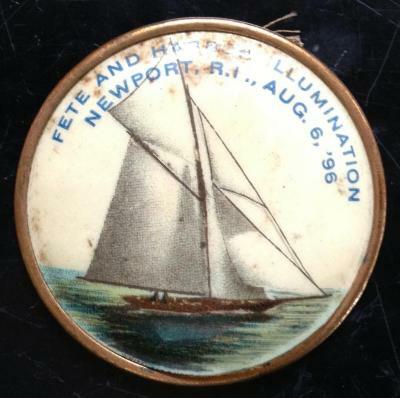 Commemorative pin for the Fete and Harbor Illumination in Newport, RI. Pin features a sailboat on the water. Round brass Newport Bridge token w/ raised center, inscribed on both sides: 'Rhode Island Turnpike And Bridge Authority'. Mark in the shape of a pilgrim hat. 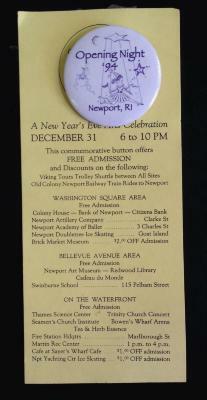 Pair of matching round, medium blue buttons; printed white logo: snowflake, Newport/Winter Festival/Jan. 26-Feb. 4/1996/A Better Idea! 401-841-5646; straight pin fastener on back. Archtectural drawing of Rockry Hall located at 425 Bellevue Avenue. Pair of matching round, dark blue souvenir buttons; printed white. 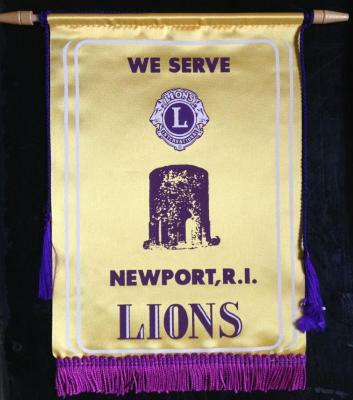 Logo: alarm clock, stars, Opening Night '96, Newport, RI; straight pin fastener on back. Swanhurst Chorus performance for "Carols of the Season" with Joan Ceo (harpist) and the Swanhurst Chamber Orchestra. Two sailboats from Sail Newport. J22 boat on the sea during the Family Fun and Sailing Festival at Fort Adams State Park. 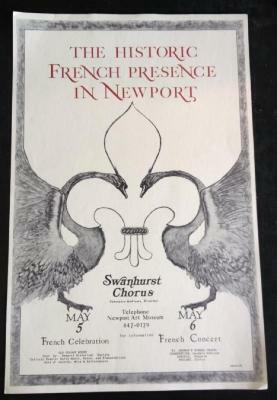 Swanhurst Chorus performance poster for "The Historic French Presence in Newport." 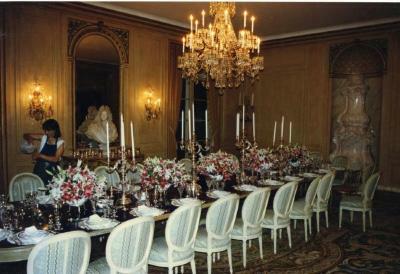 Poster features a large fleur de lis and swans. Button, round, white with red lettering reading, "Secret Garden Tour". 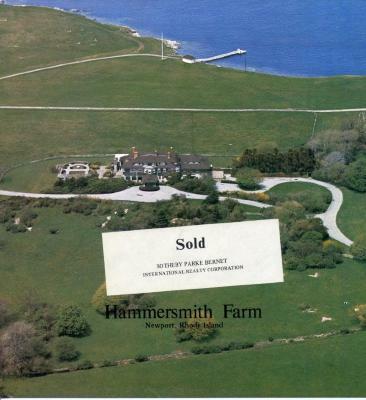 Button served as admission ticket to gardens in tour sponsored by the Point Association in Spring 1994. 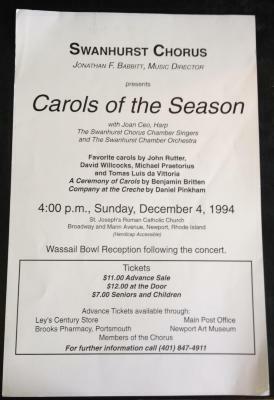 Opening Night 1994 commemorative button pinned to a program of participating institutions and New Year's Eve events on yellow cardstock. Architectural drawing showing the placement of railings and other finishing details on the second floor of the Brick Market Museum. 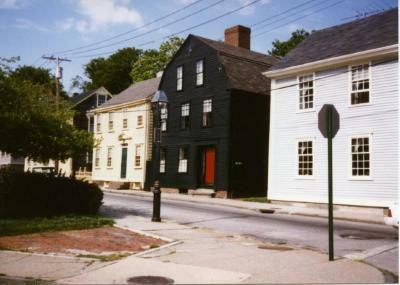 Architectural drawing of the Brick Market, Museum of Newport History showing the placement of window case trims.